Hyderabad, March 18: A key TRS leader hinted on Monday that two-third of Congress MLAs in Telangana are likely to join the ruling party in the state. Since the beginning of this month, eight of the total of 19 Congress MLAs have announced their decision to join the Telangana Rashtra Samithi (TRS), led by Chief Minister K Chandrasekhar Rao. The development, which comes close to the Lok Sabha elections in Telangana, has set in a sense of despondency in the Congress. 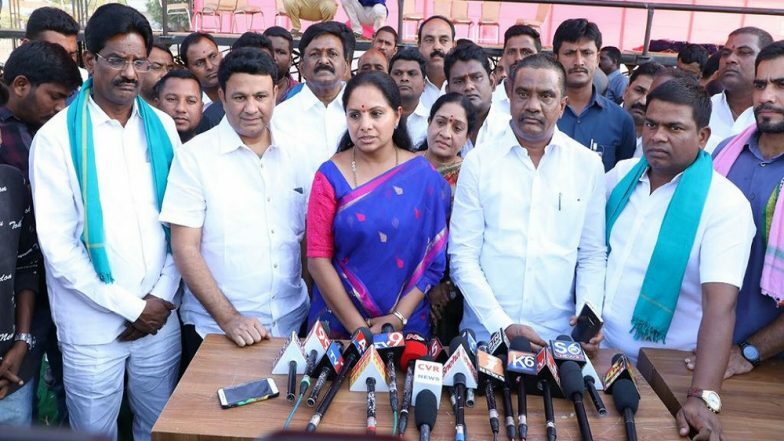 On accusations that the TRS is engineering defections, Nizamabad Lok Sabha member Kalvakuntla Kavitha, an influential party leader and daughter of the chief minister, said, "The way the state is progressing, many senior Congress party leaders and various people from the TDP, they all want to join the TRS." "And when the number is more than two-third (of total strength), we have been encouraging them (to defect). Otherwise, single MLA... we are not encouraging the defections," Kavitha told PTI. The Congress has accused the TRS of encouraging the defection of its MLAs and said it would meet the governor besides launching a campaign against the ruling party. Mohammed Azharuddin Denies Report of Joining TRS to Contest Lok Sabha Election From Secunderabad. Congress Legislature Party leader M Bhatti Vikramarka alleged that the chief minister was "conspiring to eliminate the opposition as he lacked courage to answer their questions". In the December 7, 2018 assembly elections, the TRS won 88 seats in the 119-member House, pushing the Congress to a distant second position. The BJP had won one seat. In the chief minister's first term (2014-2018), 12 of the total 15 TDP MLAs had joined the TRS.